19 of us today, including two first-timers (welcome Tom and Adam) and a welcome return of a one-time regular along with his M&S chocolate treats. JimS, Russell, Daniel, JamesS, Andrew-00, Paul, Gordon, Gareth, JamesF, Jon, Graham, Adrian, Em, Gary, Tom, Adam, Mark, Dorian, Steve. Daniel and JamesS kindly agreed to play the adult version of clowns while we waited for people to arrive in numbers. Neither had played before but soon got the hang of the game. It is interesting to see the difficulty people have with the (what I think is simple) three step turn: draw a card, choose a main action, play a card. It clearly isn't intuitive and perhaps needs a good player aid to make sure new players get it. Both Daniel and James did a lot of swapping - mainly with me! - early on, while I concentrated on getting cards down. However, I could not find the appropriate balloons to lock out my high scoring green and purple jesters (I suspect Daniel had them) and soon my matching clothing was all higgledy piggledy. We concluded with a discussion of the merits of changing the theme to Frankenstein Monsters, with Daniel not thinking it necessary but James thinking it would be good. I have now canvassed opinion from a lot of people (including teenage kids) and I am getting no clear indication which way to go! Played by: James, Paul, Gareth and Gordon. A second play of this for me and James - new to Paul and Gareth - and a somewhat skewed outing. The Old World deck delivered nobles and heroes to feed the perversion of Slaanesh and keep his Threat Wheel ticking over. Nurgle squatted big time in the middle of the board not so much spreading pestilence as hoarding it, although this did prevent Korne/Slaanesh from getting at the budding Tzeentch empire. Korne proved to have something of an aversion to blood, particularly when it came to Slaanesh (if anyone sees Paul with dice in future take them off him before he hurts himself). Ultimately an easy win for James (Slaanesh) via the threat wheel advancement. 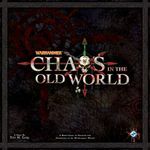 The dynamics of this game did not showcase CitOW at it's best but there is still a fun game in here which will play differently every time due to the OLD World deck - on this occasion we would have needed more experience at the game to have countered the skewing towards Slaanesh. James 1st - won via threat dial . Given the victory conditions it's hard to assign 2nd, 3rd and 4th. Jon and I tried the 1813 scenario of 1812, which can be a multi-player wargame, in its 2-player mode. The cubes might suggest to the idle passer-by that this is a Euro, but far from it! Nevertheless, there are some nice mechanisms, especially around manoeuvring for the end game. My British, Canadians, and Native Americans were trying to hold back the American regulars and militia commanded by Jon. The game plays fairly quickly, even though our game almost went the distance, and after about two hours of play, with the lines of battle going back and forth both in the east and west, I signed the truce thinking my advantage unassailable. A big push in the centre, which I couldn't repel, left Jon and the Americans singing the star-spangled banner. I was glad finally to play this, and I really liked it. As a light, quick-playing wargame it delivers. Lots to think about, and every move counts. I was interested in it as a multi-player game, but I'm not sure what team play would really add. But I enjoyed it so much I think I might buy it, or more likely the latest in the same series, 1775. A few more people arriving and rather than join the throng of people deciding what they wanted to play, I proposed a recent acquisition, a small, quick playing and fun card game about penguins forming a human pyramid. Four rounds played and Adrian continued to show his ability to win almost everything he plays. Fun game that I had been after for some while. When I arrived around 11:30, two of the tables were finished or nearly so, so I was able to get into a game quickly. This turned out to be Glen More, which is a pleasant Euro I'm always happy to play. Emily ended up going for a strategy of having few turns and so ensuring that she had the smallest layout with no penalties for number of tiles at the end - probably not a good idea as it prevented her accumulating points from her taverns. She snaffled the special tile that gives bonuses for villages, which I wanted; meanwhile I happened to keep picking up special tiles that Graham was after. Graham's attempt to score plenty from fairs didn't work very well, and my layout never really showed any synergy, probably partly because I had too many river tiles. Adrian quietly picked up points, and a huge boost with some high-scoring tiles and a massive cash pile at the end saw him romp away to a very clear win. 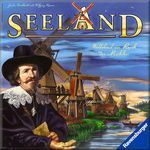 A game that seemed to get passed over when it came out in 2009, which was a bit of a surprise to me - it is worker placement (via a variable rondel), area control, (small) bonus tile scoring and a sprinkling of screwage opportunity would seem worth some interest. Then add in several dozen gorgeous coloured wooden bits (fruits) and accessible rules = a sure fire winner. Apparently not, even with a BGG rating of 7.2 (not bad after 4 years). I explained the game (I said the rules were accessible (i.e. simple)) and we were away, slightly hesitantly at first (the game takes a while to get going). b) deliver some fruit to an area (or areas) that you can match the demand (a dozen areas, each with four demand tiles but only the top one is revealed) and have the all important donkey cart. The tiles you take act as a visible VP count and have different fruit(s) on them which is important for the realisation of the bonus tiles. When an area's demand has been sated (all four cards met), the bonus tile (typically who has most of a fruit in front of them on the tiles (not actual fruit tokens)) wins the 5 point bonus. There is an additional bonus starting at 7 and dropping a point for each successive time that any player completes a "run" on their fruit tiles values from 1 through to 6. Movement on the rondel is a nice mechanism too. The rondel itself is made up of a random distribution of two of each fruit, each sail (the tiles are the blades of a windmill). You move forward the number of sails (spaces) that are on the sail you move from. And the sail you land on gives you the fruit depicted multiplied by the number of player pieces on the sail. If you cross over the meridian line of the sail, you also gain a donkey cart (necessary to effect a delivery of fruit). Game is over as soon as any six areas (less in a 3 and 2 player games) have had their demand satisfied. Game played quickly and smoothly, the only down side being that I never got going. People (OK it was Andrew and Graham) kept taking what I wanted. A close result in the end, JamesS pipping Daniel because he managed to gain a seven point bonus for completing a run of fruit tiles from 1 to 6 in value. 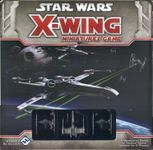 A nice little twist on the pick-up and deliver mechanism with enough interesting decisions and tactics (that won't damage the grey matter) and wonderful production values that merit the game being more popular and well known than it is. And, as I said, it can be a ruthless game. An ideal game to play while people munched their lunch time tuck. 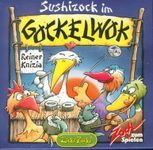 A fluffy dice game (from Herr Knizia) with plastic tiles showing sushi morsels or fish bones. Roll the dice, up to three times, and depending on the values shown either take a sushi tile (+ points ranging from 1 to 6)) or fish bones (- points also ranging from 1 to 6 but as a negative value) which you put in two stacks in front of you (one of positive point tiles, the other of the negative point tiles) or steal a tile from an opponent (red or blue depending on the colour of the chopsticks rolled on the dice). The twist is that after the last tile is taken from the supply in the middle it is time to work out the scores. You slide your two piles of tiles together and if the blue (positive) points pile is higher that the red (negative) pile, you take away the top blue tiles until they re level (these tiles do not count to your score). All negative points are always kept even if the pile is taller. My only win of the day. A fun, quick, light game while eating some lunch. 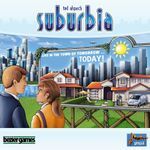 I finally managed to lure Jim away from Castles of Burgundy, with a first playing of Suburbia for both him and Daniel. This is a very simple game at heart: on your turn you buy a tile from the face up display, paying a premium for tiles that have only just come up and hence are fresh in the market. Then, you place this tile so it is connected to your suburbs; activate it and any surrounding or otherwise 'linked' tiles to earn money, population, income, and/or reputation; and finally take further money equal to your accumulated income and population according to your accumulated reputation. The key thing here is to avoid growing your population faster than your income can support it. Daniel and Jim soon got the hang of this, although Jim's city took some time to gain momentum. Daniel took my strategic advice to heart (despite me not following it myself ) and he was soon right on my coat tails after I made an initial quick spurt for growth. Biggest population wins. By the time the game ended, I was narrowly ahead of Daniel, with Jim catching us both rapidly. However, at the end of the game you score a series of goal tiles - three public for anyone to achieve - and two private that only you can achieve. Knowing how important these are in boosting your final score, I had ensured I scored both my own goals and also pipped the others to the three public goals, meaning my score rocketed away. This aspect of the game rather spoils it. The goals can be up to 20 VPs each versus a score of around 80-90 at the end of the game. And although you can see the public goals and have no excuse for letting others get them, you can't really control your own. Mine were both awarded for having 'the most' (blues and yellows), Daniel's for having 'the fewest' (not so easy to achieve). Next up after Glen More was Lords of Waterdeep - which Emily and Adrian wanted to try out. Since they were new I kept the Scoundrels of Skullport expansion modules in the boxbag. Emily, going first, left Adrian to build the first building, which was a powerful one allowing the acquisition of four fighters/rogues on payment of two coins. For most of the game, Graham and Emily kept swapping the first player marker so that they could use this building first; this made it easy for Adrian to build several more buildings. Since these were also popular, they gave Adrian a good flow of bonuses and allowed him to complete a lot of quests, thus building up a very healthy lead even before the endgame scoring. Unsurprisingly, he was Larissa, the building Lord, and the resultant 36-point bonus extended that lead still further, to a score that would be very good for a 3-player game. Overall it was an excellent demonstration of what can happen if any player (even if not Larissa) is allowed frequent access to Builder's Hall - Adrian would have won even without the bonus! Played by Mark and Dorian while waiting for a "bigger" game. A thematic and mechanically enjoyable dog-fighting romp. Darth Vader and a squadron of ties happened upon the Millennium Falcon out on a training mission with a couple of rookie x-wing pilots. With Vader and 2 Ties eliminated for just one x-wing destroyed, the remaining Imperial pilots fled the scene of their humiliation. The only element that seemed unthematic was the ease with which spacecraft could bump one another, seemingly a key tactic to keep the Falcon from being able to bring her blasters to bear. Please post your names and ratings. Thanks to Adam and Tom for teaching. Second play of this for me after a a first play well over a year ago - so needed a rules recap from Gareth who has played this a lot. The concept behind this appeals but for me this outing didn't really deliver. I'm a bit concerned at how fiddly the game is, with all of the special powers and different artifact/effect/flare cards, which still had the experienced players going - what does that do and when does it do it? Added to that I was a bit stymied throughout by my card draw, virtually no 'attack' cards. 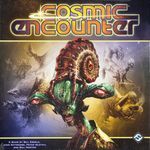 Any game with hand management and card draw can have a skewed play but as long as the game does not run long that's OK, but Cosmic can seem to over-run for what it is. Perhaps with more experience I could have mitigated/overcome my cards (and I did fall foul of a few rules/timing misunderstandings) but is this a game I will get played enough to break through that...? Gareth/Mark won a shared victory after a bit of a log-jam first few rounds with all of us with one conquered planet. I successfully fended off any attacks on my home-worlds until very late in the game but made little impact on the scoreboard in terms of getting bases elsewhere. Gareth threatened a solo win and Jonathon briefly got within one colony of winning before falling back, when his special power was wiped out by losing home planets. At which point Gareth and Mark agreed a joint win. 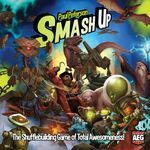 Paul's amphibians, James-T101's birds, and my reptiles were battling it out for survival during the onset of the ice age. Some of the most powerful cards came up on the first turn, and Paul got hit badly. Recovery isn't too difficult in this game, especially early on, but it was made more difficult for Paul because the watery elements beloved of his amphibians were hard to find. James went off by himself wanderlusting down one corner of the map and spreading his dominance cones here, there, and everywhere. I had an early lead which I managed to keep through the game up to the final scoring. I got some good points from Survival in the spreading tundra, although I was finding it difficult to be dominant in very many places. On the last turn, although I had a good lead, I guessed that if I let James stay dominant across the map he'd overtake me, so I switched strategies, evolved my reptiles in new directions, and spread far and wide, abandoning the ice to Paul, and the scoring Dominance actions to the others. They both netted plenty of VPs, but after we counted dominance for the last Ice Age card my plan seemed to have worked. It would all be down to the final scoring. Another exciting play of this fine game, and so close! James played a storming end-game and was inches away for over-taking me. Paul recovered well-- hope the game wasn't too tedious after being hit badly at the start? Two plays in 40 minutes, generally well received. 4 players, the first won by the lone Werewolf and the second by the 3 villagers. This game starts weak, with random pot-shots, and ends weakly too, with the result either clear for the last couple of rounds, or down to pure chance at the end, but the middle game is always very enjoyable. Post if you played so I can record your names and ratings. A game that I have been proffering for some time and Andrew has recently shown interest in playing. We managed to enrol Gary and Graham into a game. So all four of us were new to the game. This is a straightforward dexterity game, where you balance wooden cubes of various sizes on a little wooden seesaw. Each players starts with half of the cubes of each size and the objective is to get rid of all your cubes. If you make the seesaw tip, then any cubes that fall off are given to your opponent. But if you cause cubes to fall without the seesaw tipping, those cubes are added to your own stock. When one person wins by running out of cubes, the other scores points based on the cubes they have left in front of them, with larger cubes being worth more points. Dorian thoroughly trounced me at this - I think there were times when I had far more cubes in my pile than I'd started with! A game that I withdrew from my latest games for sale when I received quite a high offer for it which made me think there may be something more tp the game than I first thought. Nice game for Junior school age children, teaching very basic risk -v- reward (betting) and tactical card play (advancing the dragons). I have the score sheet for this. Gareth rated this 6 because The Resistance: Avalon is much better. In this game, you hire a crew to sail your ship to different islands as you race to set up camps and collect treasure. If you want to win the race to be the first to build camps and get paid better for doing so, it's going to cost more money to attract a better crew. The tricky part is that winning is determined by how much treasure you have at the end of the game, so the stuff you need to stockpile is the exact same stuff that you have to offer to other people to attract a crew for your ship. I did quite well at building camps and was also the first to return to harbour, but still came last overall as I'd spent too much treasure on crews for my ship (and that treasure had also boosted the scores of the players who provided those crews). Just time for a another game of the pyramid building penguins before I had to depart.